The doctor visits involved in pursuing an evaluation for FPIES can feel both overwhelming and stressful at times. No family should have to go through this process alone! The resources below can help guide you through the process of finding a professional to help your child, as well as help inform you of scholarly resources available for increasing your family’s own FPIES knowledge. We also understand that life goes on in between doctor visits. Tools such as the food journal tutorials, glossary of terms and Q & A, and Emergency Care information can help to support you and your family in your day-to-day life with FPIES. Are you concerned that your doctor may be unfamiliar with FPIES? These can help to start a conversation at your child’s next appointment about pursuing an evaluation for an FPIES diagnosis. ER tools, including a sample ER letter written and shared by Dr.Scott Sicherer. From dehydration to the medical emergency of shock, use this poster to help educate family, care providers, and more on how to identify an acute FPIES reaction. Be prepared to be asked many questions from your specialist. Your answers to those questions are essential because the diagnosis of FPIES is what is called a ‘clinical diagnosis’. This term, ‘a clinical diagnosis’, refers to conditions where there is no definitive laboratory tests to confirm or make a diagnosis. 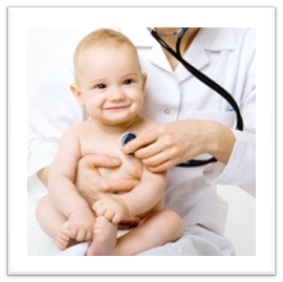 In these instances, the doctor depends on the child’s medical history to decide what is going on. Determining a diagnosis is essential for developing the appropriate immediate and long-term management plans. Symptoms that occur as a result of FPIES can be similar to those caused by other medical problems. In the young child exhibiting these symptoms it is important to consider these other illnesses. They can be as devastating and need to be excluded. 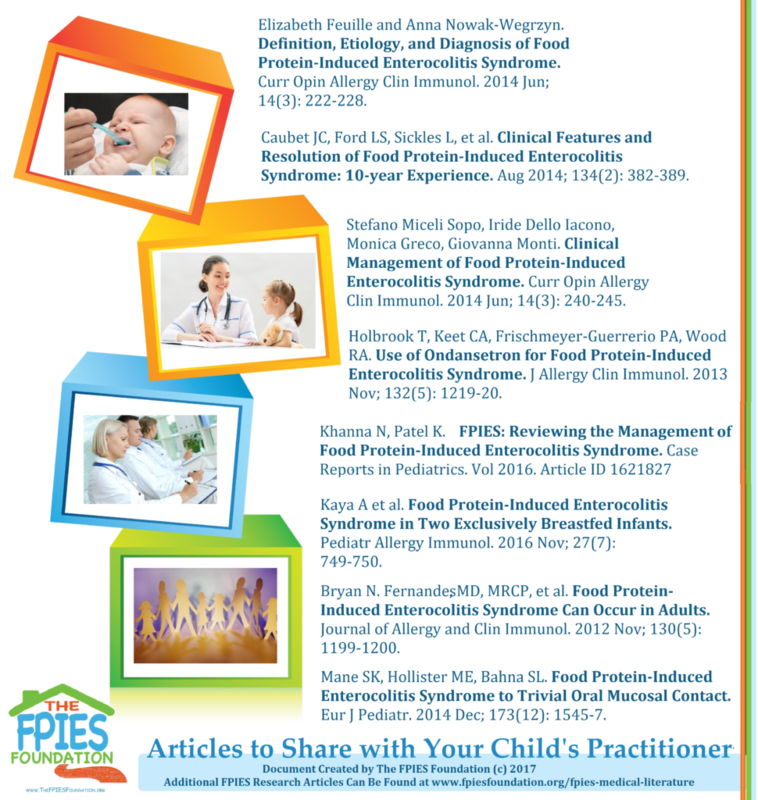 FPIES shares symptoms with viral gastroenteritis, bacterial sepsis, and food allergy. Other considerations include metabolic disorders and abdominal surgical emergencies. Tests are often performed to rule in or out these other diagnoses. What was the time course of the child’ symptoms? What was the timing from the exposure to a suspected food to the onset of the child’ symptoms? If your child presents to the emergency department, they may evaluate your child to be sure that an overwhelming infection is not at work. Young children with a severe infection may present with the signs and symptoms shared by FPIES. 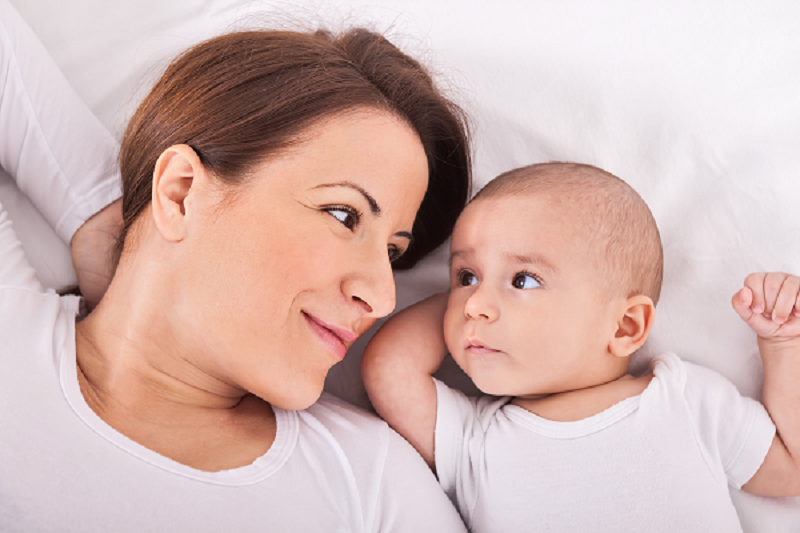 Since infection is more common than FPIES, and depending on the condition of the infant or child and circumstances at the time, a physician may wish to perform tests to exclude the possibility of an infection. Additional tests may be performed once the acute reaction has passed, typically at a follow-up appointment with an allergist. The obvious ‘test’ that could be performed to confirm the diagnosis of FPIES would be an oral food challenge; in a controlled clinical environment, the suspected food is reintroduced and the child is observed for symptoms of FPIES. It is important that the challenges be done only if necessary since FPIES reactions could be severe and life-threatening. A food challenge in a young infant who has had a significant life-threatening reaction may not be immediately necessary to make the diagnosis of FPIES, but it may be of value in the future to show that this reactivity has gone away. A food challenge for this condition would be performed in a hospital or doctor’s office. APT may be used to aid in diagnosis. However, it has not been universally accepted at this time and should be considered for use as a research tool rather than a standard test. Unfortunately, there are no other blood tests or biopsies that can be done to confirm the diagnosis. If the reaction is suggestive of a IgE immediate food reaction (classic allergy), then an allergy test(s) may be performed to confirm that suspicion. A Board-Certified Specialist (Allergist/Immunologist or Pediatric Gastroenterologist) is an important member of the health care team caring for your child with FPIES. These fellowship-trained physicians have received special education in allergic disorders of the gastrointestinal system. A University-based medical center (especially one with a fellowship program in either Allergy/Immunology or Pediatric Gastroenterology) will have physicians who are knowledgeable about FPIES. However, many community-based physicians are also well-versed in the diagnosis and have experience managing the medical care of children with severe food allergy, including FPIES. The best way to determine if a physician feels comfortable evaluating and treating a child with FPIES is simply to call and ask if you can speak with the physician briefly before scheduling an appointment. If the doctor does not feel comfortable, managing your child’s care, he/she can most likely give you a recommendation for a trusted and respected colleague who does.